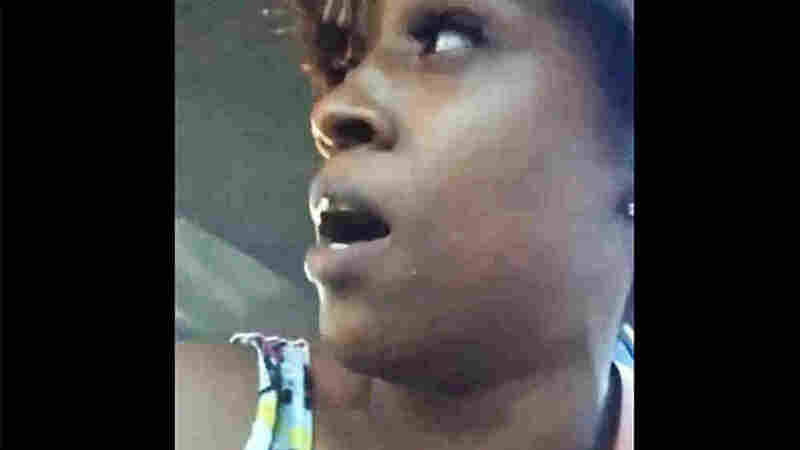 Live Video After Police Shooting Brings New Immediacy To Bearing Witness : The Two-Way Seconds after a policeman shot Philando Castile in suburban Minnesota, his girlfriend started broadcasting live over Facebook. The graphic, emotional video has now been viewed millions of times. A screenshot from the video that Diamond Reynolds live-streamed in the aftermath of a police shooting. Seconds after a policeman shot a man named Philando Castile in Falcon Heights, Minn., his girlfriend started live-streaming the aftermath live on Facebook. In the graphic, emotional video, streamed as she sits next to Castile, who is bleeding profusely from gunshot wounds, Diamond Reynolds calmly tells viewers that they have been pulled over by police for a broken taillight. She says Castile told the officer that he had a licensed firearm and the officer asked for Castile's driver's license and registration. Then, Reynolds says, the officer shot Castile multiple times in the arm. Her 4-year-old child sits in the back seat of the car throughout the incident. "Please don't tell me that he's gone," says Reynolds, who uses the name Lavish online. "Please, Officer, don't tell me that you just did this to him." As of Thursday evening the video has been viewed 4.2 million times. Even as it was streaming live, commenters offered Reynolds words of encouragement and concern. For example: "Don't stop recording." "Can somebody please go get the baby." "Get the cop's full name." And, "I'm in tears." You can read our full coverage of the incident here. This is the latest footage of a violent encounter with police to grab public attention, whether through surveillance tape, dash and body camera videos, or footage shot by bystanders. But what sets this video apart from most other prominent examples is that it was streamed live, Amara Aguilar tells The Two-Way. Aguilar is a digital journalism professor at the USC Annenberg School for Communication and Journalism. "This incident has really given viewers an unfiltered view of what happened to this woman," Aguilar says. "And it's heartbreaking, it feels very raw." That rawness has a lot to do with the immediacy of a live video. "Because it was live, it was streaming as it happened, it wasn't something that stayed on a device and could be confiscated or used as evidence or not released until later on," Aguilar says. The highly public nature of a live video also has the potential to offer some measure of protection to the person streaming, Aguilar says, though she says it doesn't appear the police were aware of Reynolds' broadcast. Aguilar notes that it's important to remember what we don't see: the shooting itself. "Certainly the video was really, really powerful, but it captured a certain moment in time and not anything before that," Aguilar says. There also may be a practical advantage to live-streaming: It can be used to broadcast a call for help. Toward the end, Reynolds tells viewers where she is and pleads for someone to come. The Facebook Live feature is newly available to all users and, as Aguilar notes, we are likely to see its uses evolve over time, from the mundane to the disturbing. Last month, a live video shot in Chicago appeared to show a police officer beating a man, resulting in a lawsuit against the officer, as the Chicago Tribune reports. The Guardian notes, "In France, a 25-year-old man killed a French police commander and the commander's partner on Tuesday, then he took to Facebook Live with a 12-minute video encouraging followers to kill prison staff, police officials, journalists and lawmakers." "We have seen people use the technology in a very frightful and horrific way," Aguilar says, "and that raises a lot of questions about Facebook's role, and also their power in disseminating this information and being a platform for this information." Reynolds' video briefly disappeared from Facebook, which raised questions about whether the company was censoring content, according to TechCrunch. Facebook said in a statement to the news site that the video was down because of a "technical glitch." It now contains a graphic-content warning: "Videos that contain graphic content can shock, offend and upset. Are you sure you want to see this?" In a separate video later, Reynolds explains — as we reported — why she started to live-stream the incident. "I did it so that the world knows that these police are not here to protect and serve us," she says. "They are here to assassinate us. They are here to kill us because we are black."